Catheter ablation of the pulmonary veins is an effective therapy for patients suffering from paroxysmal atrial fibrillation (AF). However, medicine is lacking a reliable curative therapy for patients with persistent AF, exposing more than 3 million patients in Europe to a 5-fold increased risk of stroke and cardiovascular morbidity. Recently, catheter ablation targeting areas of low voltage identified by intracardiac mapping has gained attention as a promising approach for persistent AF patients. However, wide acceptance of low voltage guided ablation is hindered by the lack of consensus regarding a clear and unambiguous method to identify such low voltage regions. Comparability of studies is limited due to different mapping methods (e.g. mapping during ongoing AF vs. after short term termination of AF to sinus rhythm by cardioversion). Moreover, there is a lack of understanding and consideration of confounding variables that influence voltage but are not indicative of an arrhythmic substrate. establish a statistical atlas of the spatial distribution of low voltage areas in AF patients and compare it with the recently published spatial distribution of atrial delayed enhanced areas in magnetic resonance images of AF patients. By achieving these objectives together with our clinical collaborators at University Heart Center Freiburg/Bad Krozingen, we will provide a clear, comparable, and unequivocal method to identify areas of low voltage in patients. This method will foster comparability between studies and centers and contribute to leverage the full potential of low voltage guided ablation. 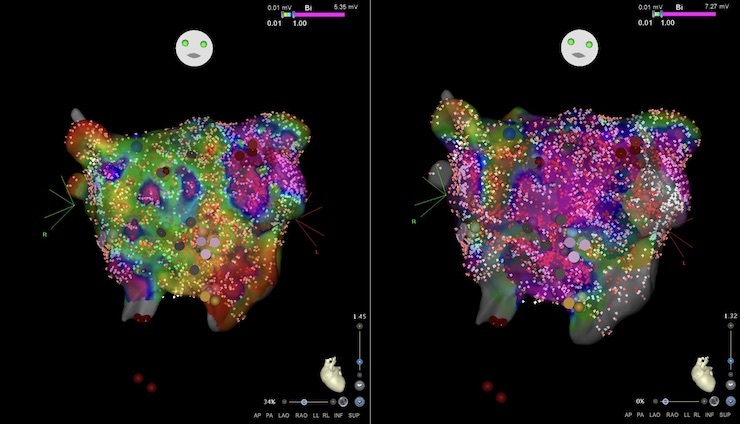 In the long run, the results of this project will contribute to overcome today’s one-size-fits-all ablation strategy with its non-satisfactory success rates and support the implementation of personally tailored ablation approaches for patients with persistent AF.